The initiation of rainy retreat or Vas has two diverging views. One school of thought says that the Buddha imposed the rule after observing the agony of a group of monks who visited him after travelling a vast distance on foot during the rainy season. The group had to undergo enormous difficulties due to unfavourable and extreme weather conditions on the way to the city of Rajagaha. The alternate view is that Buddhist Monks’ involvement in religious activities and missionary work during the rainy season being looked down and condemned by Jain sects. They were highly critical of the Buddhist monks for exposing themselves to adverse weather. The Buddha always appreciated constructive criticism. Being informed of the position taken by critics, the Buddha decided to advise the monks to confine themselves to indoors for the entire duration of Vassana season. With this, began the ritual vas or period of rainy retreat. The most significant event that took place on Nikini Full Moon Day was holding of the First Sangayana or Dhamma Council, conducted on the instructions of Arahant Maha Kassapa, under the patronage of Ajasatta, at Rajagaha. The first Buddhist council was a landmark in the history of Buddhism. The Buddha entered Parinibbana in his eightieth year. The monks who had not attained Arahant status wept and cried in grief. Among the large retinue of Bhikkhus, some joined the order for worldly gains. Subaddha, a monk who joined the order in his old age requested the mourners not to weep, but to be happy and rejoice. They are now free to act the way they desired as the Master is no more. Subaddha explained that the Buddha had been an impediment to their liberty. On hearing this, Maha Kassapa Thera courageously stepped in to conduct the First Sangha Council. Maha Theras such as Ananda, Upali and Anuruddha coordinated. Ananda Thera became an arahant at the night on the day before the council. His powerful retentive memory was extremely useful in discussing matters before the council which was held for the purpose of disciplining the Buddhist Order and arresting of further deterioration of the Order. Arahants Kassapa the Great and Ananda were the eminent Bhikkhu personalities left to take over the task of Buddhist council, since both chief disciples of the Buddha, Moggallana and Sariputta had already entered parinibbana even before the Buddha did. Seven days after the Buddha entered parinibbana, Arahant Kassapa the Great arrived from the northern territory. The arahant seldom participated in religious rituals, though practised the path diligently. He nevertheless took the responsibility for propagating Dhamma. It was 90 days following the Buddha’s parinibbana that the great assembly was held. The funeral pyre lighting was held up until Arahant Kassapa would come and pay his last reverence to the Buddha. The arahant brought a share of relics to King Ajatasattu. Then he turned his thoughts to the protection of the Master’s heritage: the teachings and the discipline. The necessity arose by Subhadda's confront of the ascetic discipline and his support of moral laxity. Arahant Kassapa took this as a warning and a challenge. That attitude would lead to the decline and destroy of both the Sangha and the Dhamma. To prevent this, Arahant Kassapa handpicked 499 monks. Ananda Thera, however, was yet to become an arahant. This was a setback because he was the one who had the Buddha’s teachings in memory. That night, he became an arahant. Leaving room for the assembly of 500 arahants, the rest of the monks had to leave Rajagaha. Vinaya expert Ven Upali Thera recited the first item of the council's programme: the text of the monastic discipline. The second item on agenda read codification of the discourses. On being questioned by Arahant Maha Kassapa, Ananda Thera (now an arahant) recited the entire text which was later compiled into five collections of the Sutta Pitaka. Lastly, some extraordinary matters concerning the Sangha were taken up for discussion. Arahant Ananda mentioned that the Buddha had allowed the abolishment of trivial rules. 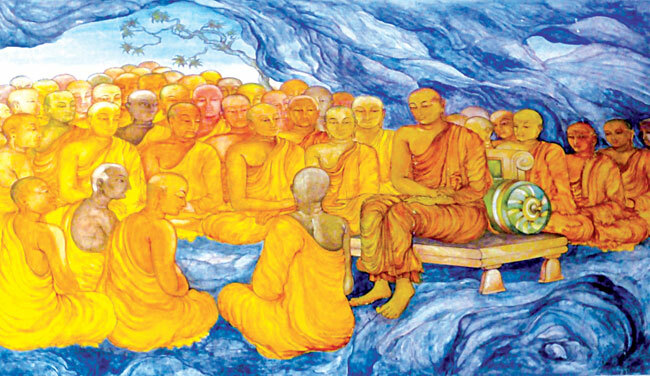 Arahant Kassapa asked whether Ananda Thera had inquired from the Buddha what these trivial rules were. The response was in the negative. Following a lengthy discussion, various opinions about this matter had been already expressed at the council. As they were unable to reach a consensus, Arahant Kassapa requested the assembly to judge the wisdom of abolishing rules in an arbitrary manner. Hence the senior monk recommended that the rules should be conserved without exception. Seen as the de facto head of the Sangha, Arahant Maha Kassapa, the oldest living disciple of the Buddha, was held in high regard. Arahant Ananda was chosen as the worthiest after the elderly monk. Arahant Kassapa handed the Buddha’s alms bowl to Ananda Thera, as a symbol of continued faithful preservation of the Dhamma. Strangely there is no record of the time or circumstances of his death. The teachings are important. However, interpreters and commentators since the first council began to distort them. It is advisable to go directly to the source, the teachings itself. The mind is occupied with problems. Therefore it can never solve them. Only an unoccupied mind can be fresh to understand them. Make an attempt to create a space in your thoughts. You will regain an originality and creativity that the normal mind, which is accumulated with one thought and be concerned and followed by another, could ever experience. It is the mind that has got us into the current mess. Closing off that mind, well-designed solutions will appear. The vast intelligence of the universe exists beyond our brain. ‘Not thinking' is the highest form of intelligence. It should be done with purpose. Most of us live as mere technicians. We study without thinking and pass exams. We learn the procedures to succeed in this society, without paying attention to beauty, love, peace, we will live in a hard, fragmented world. You can be creative only when there is abandonment. Confidence comes from thinking outside the system. Unhappiness comes from a lack of love or the distance between us and others created by our judgments and criticisms. It is difficult to put into practice love for others while we think about ourselves and our goals, this seems trivial. Love is the most practical thing in the world, it is the greatest power known to man. We have to understand our celebrity culture, in which everybody wants to be somebody, is misery.